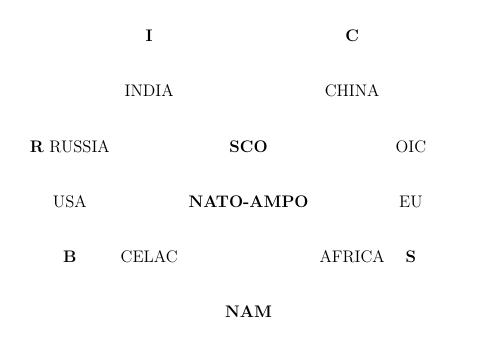 Eight big states or regions: clockwise USA, Russia, India, China, OIC-Organization of Islamic Cooperation (the 57 Muslim countries), EU-European Union (27), Africa (AU, African Union, 54) and CELAC (Comunidade de Estados Latino-Americanos e Caribenhos), Latin America and the Caribbean (33). We might link Israel and Japan to the USA with tight military relations–but Israel wants the USA to fight its wars, and Japan–even with Japanese hawks more than willing to join the nuclear club–is still bound by the constitution depriving Japan of the right to war, A9. So they work for a new constitution with an emergency article that might justify a military take-over. Ominous. Hopefully Germany does not follow suit. The eight differ in level of integration: very high for the first four big states; very weak for OIC; high for EU, but torn between the German creditor and the debtors; very weak for Africa; medium for CELAC but coming quickly. But the weak compensate with numbers: OIC well above 1.6 billion, Africa above 1 billion–like India and China–whereas USA and EU are small, below half a billion; like Russia. Economically the West, USA-EU, are in a strange crisis of their own making, badly served by that fake science called economics–read capitalistics–whether by the Black-Scholes equation for the “right price” for derivatives forgetting range of validity, the wrong ideas about the impact of a shrinking public sectors on the private sector, and the Reinhart-Rogoff scandal about relations between debt and growth. Co-responsible for speculation, crash and austerity policy; paid to serve the top 1 percent with their focus on the economy as a system, not as livelihood also for the bottom. But politicians are not forced to pick their advice unless paid by bankocracy to do so. Economists will hardly learn; politicians may take them less seriously. Then there is that outer circle–BRICS–with the comparative advantage of relying less on neo-classical economics. Harvard Business School is said to have killed much of Japan’s blooming 1970s economy; now like USA and England printing money. BRICS makes money. But, looking at the figure there is no major Muslim economy. Saudi Arabia would make it BRICSS, same pronunciation; also like China among the top world creditors. But the story is clear: West vs Rest. 37% of the world population lives in the IC part of BRICS; 60% in Asia; and their populations are young, eager to produce and consume, USA-EU-Japan–the old Trilateral–are ageing, consuming health insurance. Militarily the USA fights CELAC autonomy, intervening and micro-managing; France-England-Italy try to reconquer Africa; USA and Japan try to stop China with TPP. They will not succeed: Latin American integration has come too far, Africa will revolt against neo-colonial elites, so will African Islam; and Abe cannot have both massive export to countries Japan brutalized, refuse reconciliation, and militarize. There are three military postures across the Octagon. Down in the South is the Non-Aligned Movement, NAM, keeping off and out. In the temperate middle NATO and US-Japan AMPO are expanding, led by the giant on printed clay feet–the US military budget–with 800 Big Bang Bases, costing far more Buck than they can afford. To the East we find the rapidly expanding Shanghai Cooperation Organization, SCO, which the West officially refuses to accept as a fact–with the Russia-China-Central Asia Muslim core, and India, Pakistan and Iran as observers. RC from BRICS may expand to its acronym neighbors. Confrontations with NATO-AMPO over Syria-Iran and in East Asia could be catastrophic, dwarfing WWI and WWII. Politically, how is this evolving? Can West, challenged from South and East, move from a reactio trying to recover the past, to a proactio building an equitable niche? What would a Plan A look like? Very easy and very unlikely. USA welcomes CELAC on equal terms; EU lets Africa be Africa, finding its way toward more coherence. USA industrializes and EU agricultarizes for more self-sufficiency. There is trade between equals, intra-sector, not inter-sector. Japan uses ARF, ASEAN Regional Forum, to build (North)East Asia and Southeast Asia with good relations to USA, revising TPP to get China in, not out. USA sheds half of its bases and the military budget in this administration and the next; using the savings to lift the bottom up so they can participate in the economy and make the wheels turn. China gives up its maritime imperialism–harking back to “When the World was Asia, 500-1500 AD–and forgives 50% of the US debt in return for the 50% disarmament–keeping a policy of no military intervention. SCO cooperates, peacefully. The West focuses more on cultural growth, moves away from inequality to decent levels of equality, refreshes its democracy by controlling bankocracy and technocracy; using referenda. Germany forgives the EU periphery debt for EU equality and democracy. Plan B, prognosis: like horses running into burning stables, West spends the 21st century to sink into oblivion by economic and military means–like the Roman Empire spent its last 250 years–using the first decade of self-demolition and fact-denial as a guide. Tragic, though. There is much beauty to the West. We prefer Plan A above. Editorials and articles originated on TMS may be freely reprinted, disseminated, translated and used as background material, provided an acknowledgment and link to the source, TRANSCEND MediaService-TMS, is included. Thank you. This article originally appeared on Transcend Media Service (TMS) on 6 May 2013. Anticopyright: Editorials and articles originated on TMS may be freely reprinted, disseminated, translated and used as background material, provided an acknowledgement and link to the source, TMS: An Octagonal World, is included. Thank you.